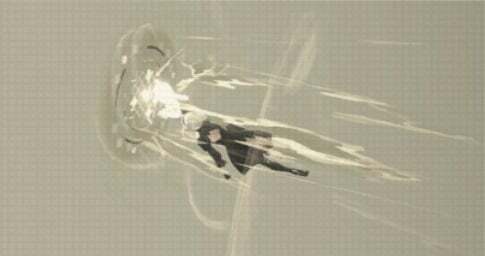 A160: Missile is a Pod Program in Nier: Automata. Pod and user rocket forward in a cone of energy with mild turning ability. Deals damage and major knockback to enemies. Charging it with more pods increase damage, knockback, and distance traveled. During route C: return to the very start of the game where 2B fights Marx (the large digger goliath). Go straight down the walkway until you can't go straight any more. The Pod Program is on top of the shipping container in a dead pod next to a dead YoRHa soldier. It gives off a high pitched beeping to help you find it. Kill everything before you try to pick up the program. The game glitched on me when I tried to pick it up, strangely enough. I killed the floaters around the dead android, but a stubby just within combat range on the other side of the fence canceled out picking up the pod and set me in the combat animation, just as I was grabbing it. The game still counted it as having been removed from the android&apos;s corpse, but it never appeared in the list of pod programs. It was a waste of maybe five minutes, but still annoying.